Russia and its NATO partners have been in deep discussions about creating a joint missile defense system, but it is unclear if they are actually working together. Just before the New Year, Russia and NATO held joint consultations in Brussels aimed at establishing a joint theater missile defense, more commonly known as the EuroPro. These consultations were held in hopes of finding a way to implement an agreement reached at the Russia-NATO Council Lisbon Summit on creating a common missile defense system. Colonel General Valery Gerasimov, the Deputy Chief of General Staff of Russia’s Armed Forces, headed the Russian delegation to the talks. Although no results of the negotiations have been reported in the media, many military experts believe Moscow and Brussels will have an extremely hard time finding common ground on the subject. Pessimists even maintain that this is impossible altogether. There are several reasons for that. First, both parties differ in their assessments of missile threats to the Europe. Moscow considers the Iranian missile threat far from certain, even non-existent, while Brussels and Washington have made neutralizing this missile threat their top priority. The Russian military insists that Tehran has no missiles capable of reaching European capitals and will not obtain them within the next 15 to 20 years; Iran’s current technological, technical, and scientific missile development stunts the country’s missile capabilities. All that Iran has at the moment are not very successful modifications of the old Soviet operational and tactical Scud-D (range: 600 km) and R-27 missiles (SS-N-6) with up to 3,000 km in range supplied by North Korea. It is impossible to build a strategic missile based on these types of missiles. Second, the parties will find it very hard to agree on principles and a structure for a European missile defense system. Russia insists that any system should be developed based on the sector principle. President Dmitry Medvedev reiterated this in Lisbon. In other words, NATO is supposed to be building its system along European borders and Russia along its own borders. Accountability areas may overlap occasionally, but that is not a problem. What is most important is that each party is responsible for its particular security zone, while letting the other party know what’s going on in the air and outer space it covers. If, for instance, an enemy missile appears over Russia on its way to Europe, it will be up to Moscow to decide whether to shoot it down. NATO will have the sovereign right to decide the fate of any missile crossing over Europe towards Russia. Brussels isn’t happy with this approach, probably because it doesn’t trust Moscow very much. NATO is insisting on deploying its own missile defense shield in many different areas, not just along Europe’s borders, and inviting Russia to participate if it wants. This approach prompts several questions, including the most basic one: Who is this articulated missile defense system directed against? Russia dabbled in creating a joint missile defense system with NATO at the beginning of 21st century, and even took part in several joint command and staff exercises. Later on, however, it became apparent that NATO was developing the system as part of the United States’ strategic missile defense, which the administration of George W. Bush tried to deploy in Poland and the Czech Republic and was aimed squarely at Russia’s strategic defense forces. Whether this latest attempt at a European missile defense system is just yet another effort to help the U.S. ally under a different pretext, remains to be seen. It was perhaps no coincidence that before the start of the EuroPro consultations in Brussels, the commander of operational and strategic command forces of Russia’s air and space defense, Lieutenant General Valery Ivanov, said on the Vesti 24 news channel that by the middle of 2011 Russia will have new air and space defense forces. 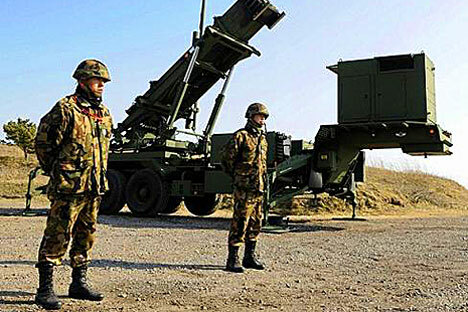 They will incorporate five sub-systems: air defense, missile attack warning, outer space control, radio and electronic warfare and missile defense. He added that Moscow, currently defended by the active S-300 and S-400 anti-aircraft missile complexes and the new Triumfator (the promised S-500 – V.L.) system that is undergoing tests, will see the addition of the Pantsir close-range missile and artillery anti-aircraft complex that will come online in March or April. Incidentally, an agreement between Moscow and Brussels on joint missile defense should be reached about the same time. Apparently, the general was making it clear to NATO that Russia is all for creating a joint Euro missile defense system. Whether anyone in Brussels is listening, however, is a big question.